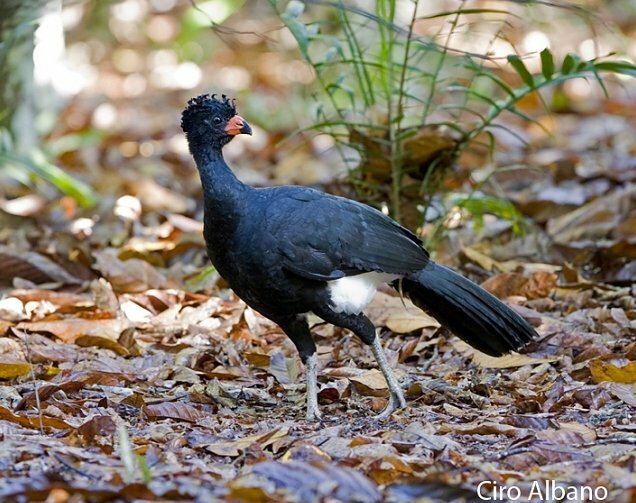 Red-billed Curassow (Crax blumenbachii), a large, ground-dwelling bird belonging to the same family as the more familiar Plain Chachalaca of southern Texas, was never a very widespread species. Formerly distributed across parts of southeastern Brazil from the state of Bahia to Rio de Janeiro, this Brazilian endemic suffered dramatic declines due to chronic loss of its lowland Atlantic forest habitat. According to Birdlife International, the tiny percentage (less than eight percent) of lowland rainforest that remains north of Rio de Janeiro is safeguarded in island-like reserves, while the vast majority has long since been converted to pastureland. Unfortunately, the Atlantic Rainforest is also a major hotspot for avian diversity (over 900 species) an important center of avian endemism — a large percentage of its birds are found nowhere else. The result is that lowland Atlantic Rainforest harbors one of the largest assemblages of endangered bird species in the world. Wild populations of this particular species survive in only eight reserves, with population estimates pegged between 130 and 170 mature individuals. About 600 individuals currently live in captivity as part of a breeding program, and there are reintroduction programs underway in the states of Minas Gerais and Rio de Janeiro. Curassows are such stately birds. Photo courtesy of Ciro Albano. Fortunately, naturalists can still observe this species quite readily at the Linhares Reserve (it harbors the largest wild population by far) in northern Espirito Santo, a 22,000 hectacre preserve that protects a piece of secondary lowland forest. In 2013, Dalcio Dacol and I paid a visit to this reserve as part of an independent, month long birding trip in southeast Brazil. Although the birding was very slow and the secondary forest wasn’t easy on the eyes, we had a memorable encounter with this species on one of the dirt tracks. Our strategy on each day was to be the first people on the road in the morning. A Solitary Tinamou, a pudgy and notoriously shy ground bird, materialized first on the track. About thirty minutes later, a few distant views of the Red-billed Curassow. Is that all we are going to get? Or so we thought. We parked the car and walked for hours to seek out other species. It was quite late in the morning when we saw a family group consisting of an adult and three nearly fully grown juveniles right on the track about 300 meters away. What happened next was pure magic. 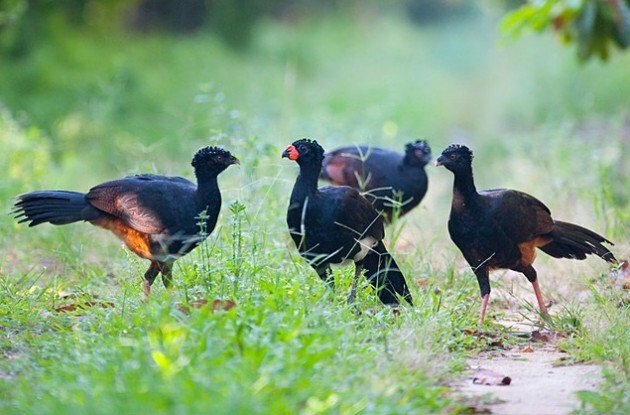 The curassows began to walk towards us! We crouched to our knees to look as small and harmless as possible. After about thirty minutes, the birds came within less than ten feet, making soft vocalizations and seemingly as curious about us as we were about them. Dalcio tried to take a photo of the moment, but the movement was enough to cause them to change their minds about us and head back into the thick forest. And that was it. There are certain birding experiences that stay with you forever. Having a family of endangered Red-billed Curassow willingly approach me to within such a short distance is definitely one of them! Other endangered and vulnerable species we observed at this preserve included Red-browed Parrot, Ochre-marked Parakeet, and White-necked Hawk. Linhares is a stronghold for all these species. The birding is not easy at Linhares, but it still offers a hint at the former biodiversity that was once widespread along the coast of southeast Brazil. The featured image courtesy of Joao Quental. I was left to wonder how closer would they get had I not try to get a photo… Unforgettable moment!